Russia launched a long-delayed radio telescope Monday to help astronomers see deeper into supermassive black holes, obtain views of collapsed stars and better measure the influence of dark energy on the cosmos. It was the largest Russian-led space telescope to launch in two decades. The launch came a few months before Russia plans to send a probe to Mars in November on the country's first interplanetary mission since 1996. 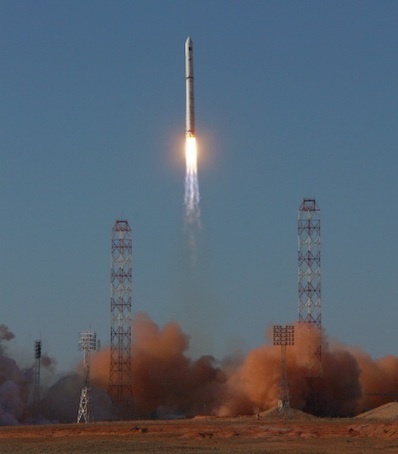 The 8,000-pound Spektr-R spacecraft blasted off at 0231 GMT Monday (10:31 p.m. EDT Sunday) on a Zenit 3F rocket from the Baikonur Cosmodrome in Kazakhstan. The 20-story rocket rumbled into a clear morning sky at Baikonur, disappearing from view as it shed its kerosene-fueled first stage above the stratosphere. Less than 10 minutes after launch, the two-stage Zenit, supplied by Ukraine, placed the Russian Freget upper stage into a parking orbit a few hundred miles high. The Fregat stage fired twice to propel the Spektr-R satellite into a higher orbit reaching as far as 210,000 miles from Earth, according to Roscosmos, the Russian space agency. The Fregat upper stage released the satellite at 0606 GMT (2:06 a.m. EDT), Roscosmos reported. 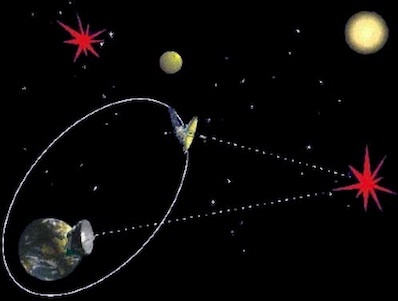 The craft's flight path will naturally shift due to the influence of the moon's gravity over the course of the five-year mission. It will take Spektr-R up to nine days to go around the Earth in its egg-shaped orbit. 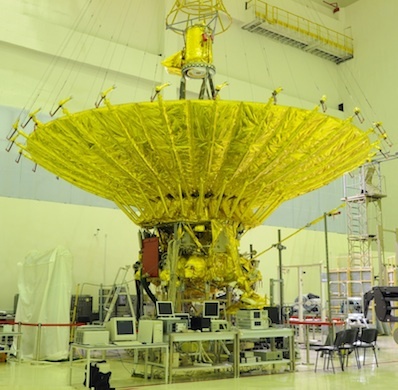 Spektr-R will next extend two solar arrays and unfurl its flower-like dish receiver antenna to a diameter of 10 meters, or almost 33 feet. It is comprised of 27 carbon fiber petals that take up to two hours to fully deploy. The RadioAstron project could potentially answer the question of whether the galaxy's core actually contains the mouth of a wormhole, a theorized shortcut through space and time, according to the Lebedev Physical Institute's Astro Space Center, a division of the Russian Academy of Sciences. 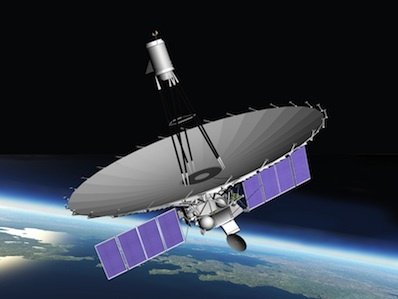 Before Spektr-R, radio telescope interferometers were limited to the size of Earth. But the Russian-led satellite mission was deployed in an orbit taking it nearly to the moon, adding a new observatory to the chain of ground-based facilities and expanding their collecting area into space. Russian scientists first drew up plans for the Spektr-R mission three decades ago, but the project was mired in economic muck during the fall of the Soviet Union and the early years of a new Russian government. After scrapping a complex spacecraft design riddled with technical problems and rising costs, Russian engineers settled on a more modest mission in the early 2000s. The RadioAstron project includes major contributions from the United States, China, India, Australia, Japan, Germany, Spain, Italy, Finland, Hungary, the Netherlands, and the European Space Agency.